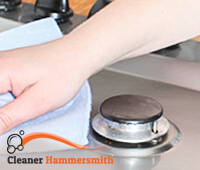 Our company offers oven cleaning services that will help you maintain the utmost cleanliness of your kitchen. 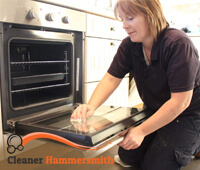 If you live in Hammersmith and you are looking for professional cleaning of your oven, then rely on our cleaning technicians. Their experience and skills are unlimited, so that you can be sure in their successful performance. Over the years we acquired knowledge of the weak spots and difficulties in the oven cleaning and we managed to develop innovative detergent, which is entirely biologically-based for your safety, but relentless to any kind of grease or dried stains and provides long-lasting effect for your oven. Our rates are fair and our working schedule is unlimited. You spilled milk on the oven long ago and it dried, or you boiled the dish too much and it came out of the top? No problem. Entrust your oven in our proficient hands, and you will have one ready for the market, shimmering oven. Our cleaning technicians are well-known with their detail-oriented manner, so they won’t leave your home, without being sure that everything is cleaned. They will firstly inspect your oven to find its weak spots, and then dismantle it for better results. All the parts of your oven will be soaked in a detergent, so that all the grease and dirt will be cleaned easily and in a flash. For all the people in W6, who are strict enough to satisfy only with best quality and shining results, we are your right option. If you are sick and tired from all the build-up and stubborn grease, get rid of that chore and leave it to us. Book your budget-friendly oven cleaning services with us, and you will never consider to clean it by yourself again. Pass by our office in Hammersmith, W6 or give us a call and we will respond you immediately.